Should You Splurge On a Sprinkler System? 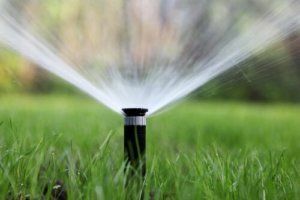 Home > Blog > Outdoor Living Spaces > Should You Splurge On a Sprinkler System? In an area of the country where the rains don’t come very often, the only way to keep your Phoenix landscape thriving typically requires supplementary watering. Sure, you can manually haul out your sprinklers and set them up around your yard, when necessary. However, when you live in an arid location – like Arizona – that needs frequent irrigation, this task becomes overwhelming quickly. A sprinkler system might be more than a convenience – it can actually make the difference between a beautiful lawn and landscaped areas that suffer from lack of moisture. One major benefit involves improving your lawn’s overall health and appearance. With regular watering at just the right levels, your lawn will respond with healthy growth. It also can add to the value of your property. Furthermore, an added advantage of installing a lawn sprinkler is water conservation. With an installed sprinkler system, the amount of water that disperses onto your landscape is just the right amount to irrigate your yard without wasting more water than necessary. And when rain actually falls, many sprinkler systems have a sensor that automatically detects the natural moisture and stops the sprinkler from running. There are numerous lawn sprinkler systems on the market today. Your final choice obviously depends on your climate, the terrain of your landscape and your type of landscaping. For example, spray irrigation involves water spraying over your landscape. Tubes are placed on the soil and water moves through these tubes, spraying out from sprinklers at specifically timed intervals. Spray irrigation is easy to install and is ideal for light soils. There’s also drip irrigation, a process that involves water moving through buried tubes with holes that allow the water to dissipate into the soil. With this type of system, the water does not enter the air, it stays completely underground at plant roots. Drip irrigation uses less water, so over time, you may save money with this type of system. While putting in a sprinkler system may seem complicated, most professionals can install an average system in as little as one day. While you can have them installed at almost any time of the year, it’s best if the soil isn’t overly wet or dry. Ideally, you should hire a professional to install your sprinkler system in the spring or the fall. If your property doesn’t currently provide the landscaping or outdoor living spaces you would like, Republic West Remodeling can help. As leading home contractors in Phoenix, we are ready to share our years of expertise with you. Contact us today for a free consultation.